All the king's horses and all the king's men bring you the most fabulous baby shower theme: Humpty Dumpty. We're loving our new printable baby shower invitations that are perfect not just for a baby shower centered around nursery rhymes but would also fit in perfectly in a storybook-themed baby shower. What's really great is that our Humpty Dumpty theme works for baby boys, baby girls or even if you don't know the baby's gender. 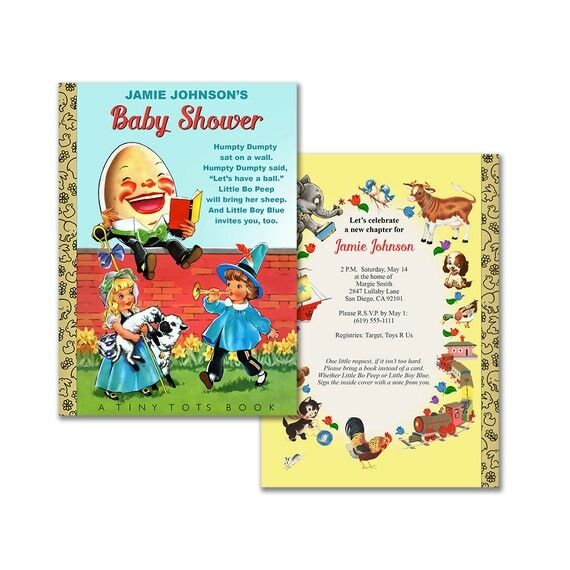 You'll love how the baby shower invitation looks just like a child's storybook. It comes as an editable PDF so you can customize your own text. We've also got some cute printable party accessories that match this adorable invitation: a set of tickets that can be used for a diaper raffle; a library card that doubles as your thank you card; and a bingo card that encourages guests to guess what gifts they think the mother-to-be will receive. Just to inspire you, we're sharing some of our favorite Humpty Dumpty baby shower ideas from around the web. 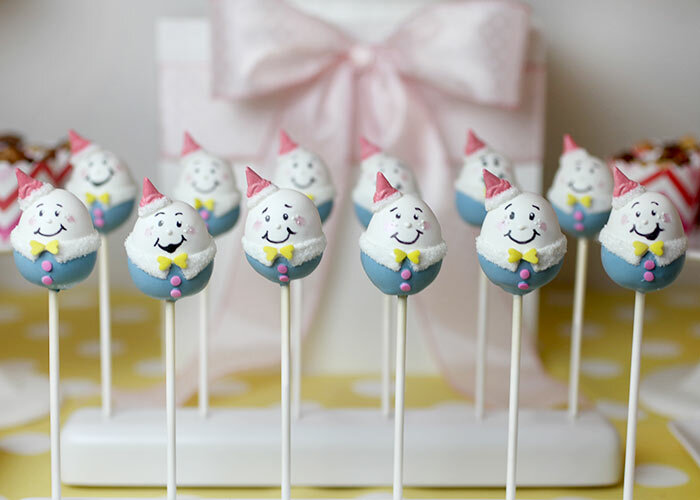 First of all, a Humpty Dumpty baby shower wouldn't be complete with the fabulous Bakerella's Humpty Dumpty cake pops. Just looking at them makes our mouths water. Bakerella teamed up with her friend, Cupcake Julie, who created the most awe-inspiring decorations for a Humpty Dumpty-themed baby shower. 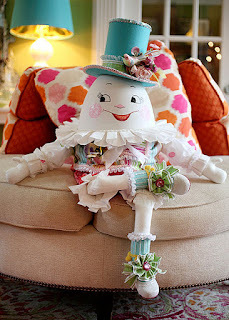 We're loving Julie's elaborately decorated plastic egg that is the centerpiece of the party. So you'll definitely want to hop over to Bakerella's website to see the photos. Meanwhile, Stefanie, an event planner over at The Petite Soiree, spent months planning a Humpty Dumpty-themed baby shower, and the hard work paid off. It's amazing. Her shower also included an eye-catching centerpiece featuring Humpty Dumpty. 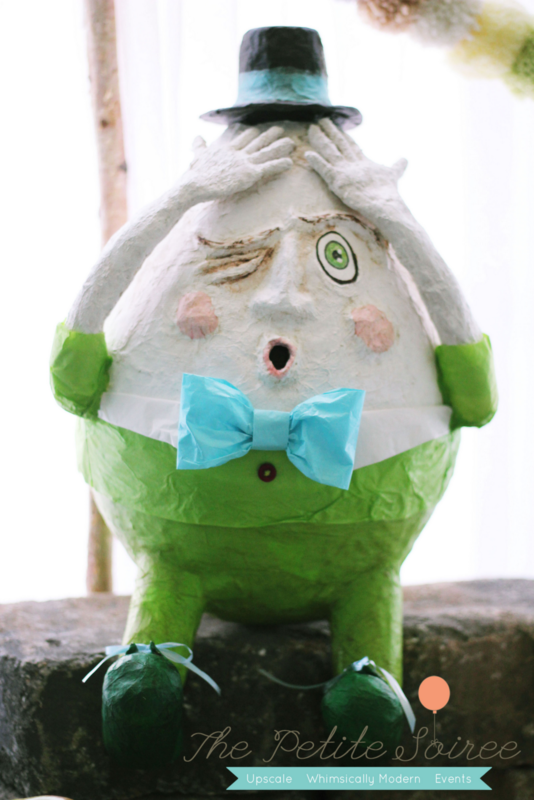 The Humpty Dumpty used in the Petite Soiree's party was made by Wunderland out of paper mâché then painted bright green and topped off with a bright blue bow tie. 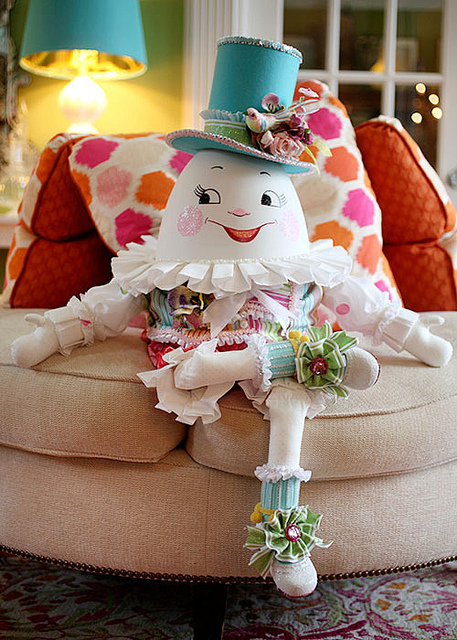 Don't want to make your own Humpty Dumpty party decor? 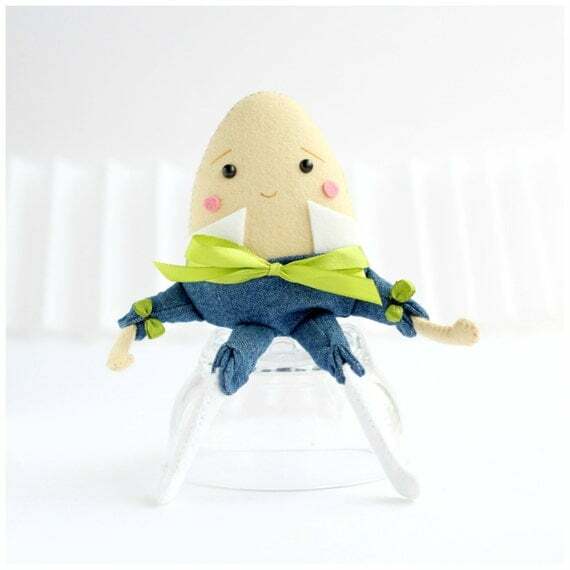 Then head over to Whisper of the Pipit's Etsy shop to pick up the perfect little Humpty Dumpty for your baby shower. This felt doll is almost 8" tall and would make the perfect party decoration, then it can be used to decorate the baby's nursery afterward. Of course, no party would be complete without food, and lots of it. And we're just over the moon about Magnolia Event's nursery rhyme baby shower. They gave the food the cutest names: Little Boy Blue haystacks, Three Little Pigs pigs in a blanket, and Hey Diddle Diddle moon sandwiches, just to name a few. Magnolia Events used Mother Goose themes throughout the party. And Mother Goose even paid a visit to the party! We hope this has inspired you to create your own special Humpty Dumpty baby shower.